SSD – Solid State Drive. Windows takes some 40 to 60 seconds to boot from when it starts displaying the “starting windows” logo. A computer fitted with an SSD? From 6 to 20 seconds depending on the drive you buy, your computer speed, age of technology and on what operating system you are running. For Windows XP, it will take longer than Windows 7 to start, but Windows 8, despite some people saying uninformed things about it can be even faster. To simplify things for the layman, Traditional Hard Disks read like an old phonograph record – except the heads are magnetic, not a needle and the data is stored in magnetic bits of information instead of grooves in a record. The record inside the drive (platter) spins anywhere from 5,400 to 15,000 RPM and the drive can usually be heard making a faint humming or ticking noise as it reads data from the drive. When the drive makes loud clicking noises, it has usually been bumped and it is time to back up your data. Obviously as it is mechanical, it draws quite a bit of power compared to the new SSD technology. More power = more heat = less battery life for notebooks. An SSD is like a really fast USB thumb drive and works in a similar way to a flash drive. It has no moving parts and consists of memory chips, is generally 3~5 times faster at reading and writing information/data than a hard disk. It has a longer time between failure than a traditional hard disk too. An added benefit is that when it begins to fail, it will usually retain the information. You will usually be able to “read” the drive, but you will lose the ability to “write” as the drive fails. Unfortunately SSD, as all new technology comes at a price and like all new technology, it will fall in price as the technology gets cheaper – hopefully. What may prevent the price falling? Well, just like Hard Disks were kept at quite a high price due to people wanting to record their TV shows on their PVRs and raising demand for large storage drives, cell phone manufacturers are keeping the demand for the SSD memory high by preferring the low-power, high speed storage of internal memory that SSD’s use. Size is limited too – while Hard Disks may go up to 4000Gb (aka 4Tb), you seldom find an SSD bigger than 512Gb at the moment – we recommend 64Gb~256Gb as best value for money. Who would use an SSD? Anyone and everyone essentially. We are fitting 64Gb drives to all our corporate sites at the moment as standard. A 64Gb SSD costs about the same as an entry level 500gb drive, but users don’t need more than 20~30gb of space to be productive in. Usually, depending on job description, only when a user starts putting personal, non-work related photos and movies on their drives do they usually fill up past the 30gb point. I have been using an 80gb drive in a work machine for years and never needed more than 30gb of space. In any event, staff should be trained that everything work-related “should” be saved on the server so that it may be backed up at night. Solid State Drives are also great for people who want a drive to use as a “scratch” drive for editing work like big photos, CAD jobs, massive spreadsheets or basically any program that needs a boost in performance. Everything loads almost instantaneously from an SSD. Notebooks immediately get a boost to battery life and fitting an SSD makes it behave like a tablet – better in fact – as you can see in the YouTube video below. Even an entry level 2nd Generation i3 Notebook seems to behave like a completely different appliance when you fit an aftermarket SSD. 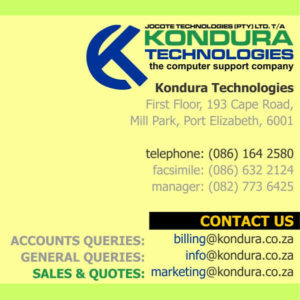 From a productivity point of view, we at Kondura still prefer a Notebook /or Netbook running Windows, Office with Word, Excel & Outlook over a tablet. Tablets are great for e-mail, news, social networking, photo’s, but for quotes, etc we find a notebook to still be tops. Data on an SSD is almost impervious to bumps and device can be moved while on without any risk of damage /or data loss. Everything gets a speed boost – loading applications to PC reboot time significantly decreasing. At a minimum, a 30% application load time speed boost is apparent. More stable as an SSD has almost 1/2 million more hours of estimated life before failure. An SSD is safe from magnetism whereas a traditional hard disk is not. Did we mention it’s fast? An average SSD has 200Mb to 530Mb per second READ times and an average mechanical Hard Disk is 80Mb to 120Mb per second reads. Expensive per Gb. 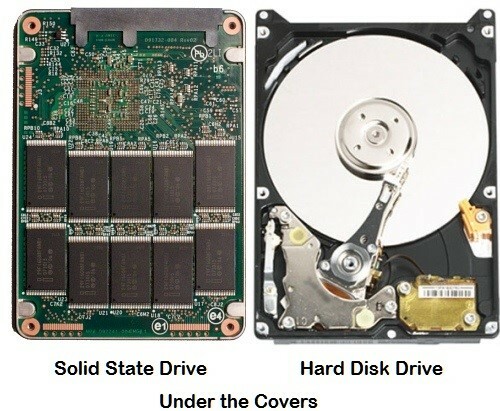 If you need a lot of storage space for your movies, data, server, you will prefer a traditional hard disk. Other than that, an SSD pretty much walks over the older technology. The major problem with using an SSD? Once you’ve used a computer / notebook with an SSD, you will feel like every other computer has a major problem due to it feeling so slow. Yes, it makes that much of a difference. For corporate customers, We sincerely recommend that you do a trial upgrade run on computers / notebooks that are 3 years old in your firm and ask your IT guy to fit a few of these and a bit of extra RAM (memory). You may save yourself the need to purchase a new computer /or notebook as most programs are slowed by hard disk due to their sheer size. Fitting an SSD may prolong your technology life two to three years and if the computer does crash during this time due to some other problem, the SSD can be transferred to another PC. This entry was posted on 11th August 2015 at 09:46 and is filed under BLOG Posts. You can follow any responses to this entry through the RSS 2.0 feed.